Infectious bursal disease is an acute, highly contagious, immunosuppressive disease that affects young birds causing important economic losses in the poultry industry. Its etiological agent is the Infectious bursal disease virus (IBDV), a non-enveloped bi-segmented double stranded RNA virus which belongs to the Genus Avibirnavirus from the Family Birnaviridae. Currently, control of IBDV is normally achieved by vaccination programs with inactivated and live attenuated viruses. However, conventional vaccines have a number of disadvantages due to their viral nature and, in many cases, fail to provide sufficient protection against very virulent and variant strains of IBDV. Several new vaccines have been developed as alternatives to solve these problems. Among these rationally designed vaccines live viral-vectored, immune complex and subunit vaccines are found. 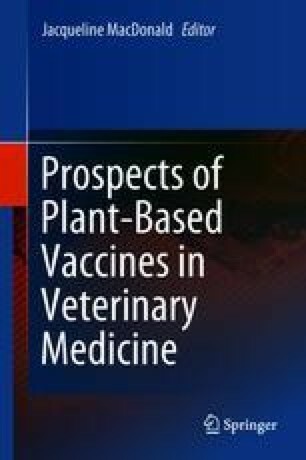 In this chapter, the contribution of these new technologies to the field will be addressed, with special focus on plant-made vaccines candidates against IBDV. The rationale, efficacy, and yield of these plant-based developments, as well as the comparison to established vaccines or alternatives will be discussed.